* exclusive bundles with shirts, plus digital options are also available! The album was tracked primarily at The Brick HitHouse in Hyannis, Massachusetts with producers Peter Rutcho (REVOCATION, RAVAGE) and Shane Frisby (BECOMING THE ARCHETYPE, BURY YOUR DEAD) with vocals produced by Zdenek Sikyr at Studio Hostivar (CULT OF FIRE, MASTER'S HAMMER) in Prague. Having worked with Rutcho since 2010, it was a painless, professional process, the band also bringing in Chaney Crabb of ENTHEOS to add a guest vocal to the devastating "Penance". 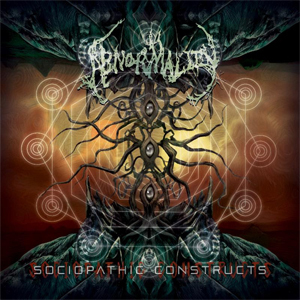 "Sociopathic Constructs is the result of tons of hard work and shows the progress we have made as a band since Mechanisms (2016)," asserts Sundaramurthy. "We feel the time is now for such an album, the brutality perfectly reflects the darkness, violence, and harsh reality of our world." Sociopathic Constructs serves to further cement ABNORMALITY's place at the cutting edge of savage ultra-technical death metal. With this release, the quintet have stepped up their game across the board, making for a record that is as violent, complex and thought provoking as any you will hear in 2019, and the band were not afraid to explore and mix things up. "I think this record we felt free enough to just go where we wanted to within a song," states guitarist Jeremy Henry. "We had no qualms with switching styles and approaches from riff to riff. To have a whole section grinding away and then just switch gears, hit the brakes and drop a slow, old school MORBID ANGEL warship groove in there. We felt free to follow our instincts, and just let our influences shine through." "A Catastrophic and Catalyzing Event"